The play started when Sidney Crosby received a breakout pass from Paul Martin while skating full speed out of his own end. Crosby proceeded to slither through a tiny sliver of space between an approaching Jakob Silfverberg and the boards before coming up to his next obstacle in Erik Karlsson. Crosby then made the defending Norris Trophy winner look like a pylon as he deftly stepped around him and drove to the goal. Crosby finished by outracing Mika Zibanejad to the net and beating arguably the league’s best goalie this season in Craig Anderson through the five-hole to open the scoring in the first period of Friday’s Game 2 of Pittsburgh’s Eastern Conference semifinal series against the Ottawa Senators at CONSOL Energy Center. Just another epic, jaw dropping, goosebumps-inducing play from the 25-year-old superstar, exactly 22 years after Mario Lemieux split North Stars defensemen Shawn Chambers and Neil Wilkinson before deking around Jon Casey on this day in 1991 for the greatest goal in Penguins history. How fitting. That goal was just the beginning of a big night for the Penguins captain. He scored two more goals for his second career playoff hat trick (his other coming in Game 2 of the 2009 Eastern Conference semifinals vs. Washington) – all three coming by the beginning of the second period in a 4-3 win over the Senators to give Pittsburgh a 2-0 series lead. 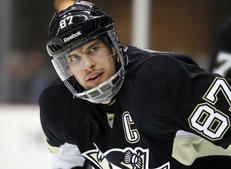 Crosby is just the second Penguins player other than Lemieux to notch multiple postseason hat tricks. Crosby is usually very thoughtful, composed and reserved and doesn’t like to talk much about himself, but he allowed a big smile to spread across his face when asked about what it was like to score his first playoff hat trick at home. Crosby’s three points moved him into sole possession of fourth place on the franchise’s playoff scoring list with 102 points, surpassing Ron Francis (100) with his second goal of the game. He became the fifth player in Penguins history (behind Francis, Kevin Stevens, Jaromir Jagr and Lemieux) and 84th player in NHL history to reach the 100-point mark, which he did in his 75th career playoff game. But perhaps the most impressive part of his feat is that he is the fifth youngest to do so – behind only Wayne Gretzky (46), Lemieux (50), Jari Kurri (67) and Mike Bossy (74). Crosby’s third goal, scored with a big slapshot on a power play (the other two came at even strength), chased Anderson from the net with hats raining down onto the ice all around him to add insult to injury. Backup Robin Lehner replaced him in goal, allowing one goal on 21 shots in relief. Crosby now has six goals (tied for first on the team with Pascal Dupuis) and 12 points in seven playoff games this postseason (which ranks second on the team behind Evgeni Malkin). The captain led his team to a big win and the perfect situation, up two games to none going into Ottawa for Games 3 and 4. The Penguins know they’ll see more of the same from Crosby heading onto the road – he’s just that kind of talent.